Employee Experience is about focusing on long term change, evolving and modifying the core workplace practices. The big shift that we’re seeing is moving away from working within the system to actually changing what that system. 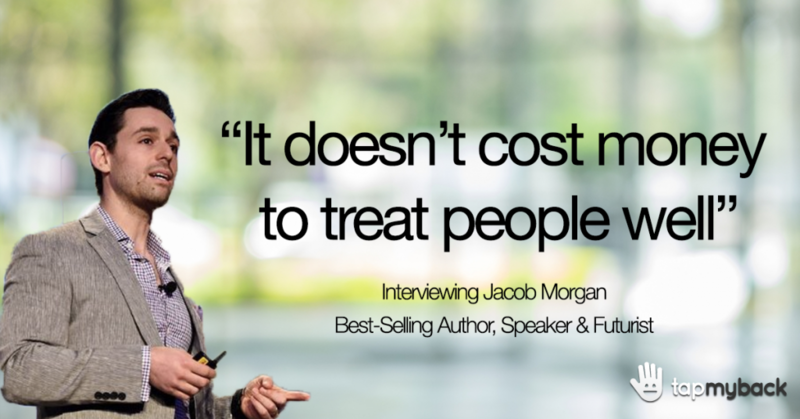 Jacob Morgan is a 3x best-selling author, keynote speaker, and futurist. His latest book is “The Employee Experience Advantage: How to Win the War on Talent by Giving Employees the Workspaces they want, the Tools they Need and a Culture They Can Celebrate” (Wiley, March 2017), which is based on an analysis of over 250 global organizations. In this interview, Jacob goes through the concept of employee experience and its potential impact on a company’s ability to retain talent. Based on his on-field extensive research he claims employee experience is the next level of employee engagement. And that the organizations that are already investing in it will obtain a competitive advantage in the XXI century. Find out what is beyond this superpower to retain talent. How did your journey on subjects such as the future of work and employee experience start? Sure, basically it started with me having bad jobs working for other people. After I graduated college I went to work for a company in Los Angeles. I was told that I was going to be doing a lot of fun and wonderful projects. Instead, I was doing data entry and cold calling. Then, one day the CEO asked me to go get him a cup of coffee… That was one of the last jobs I’ve ever had working for somebody else. Ever since I became very interested in and passionate about the future of work and employee experience. So, bad jobs working for other people was the main reason why. Can you explain what does “Employee experience” mean? Employee engagement has been very valuable for us. Unfortunately, the big problem is that is has always acted as kind of an adrenaline shot inside of our organizations. Typically what happens is that an organization does an annual employee engagement survey. Then, they find out that employees are relatively unhappy and they try to introduce some kind of a perk. This includes free food, maybe work from home on Friday, you know, some kind of a perk. The problem with that is that it does very little to motivate employees. What are the advantages for companies investing on it? Does it help to retain talent? Instead, what we’re starting to see is this shift from engagement to employee experience. This is actually changing the core workplace practices around how employees work. The concept involves neither adding perks nor focusing just on the short term change. Rather, it focuses on long term change, you know, evolving and modifying the core workplace practices. The big shift that we’re seeing is moving away from working within the system to actually changing what that system. Within companies which department/position should assume employee experience as a responsibility ? Well, we’re starting to see a little bit of a mix here. In most organizations, the department that typically drives these initiatives is in HR. We usually see those people being more responsible for driving this kind of a change. It’s something that everyone should be responsible for. From the CEO of the organization, to the managers that help drive employee experience to the employees. Employees are responsible for speaking up and sharing their own ideas around what they want their experiences to be. So, everybody has some accountability when it comes to employee experience. But, as far as the team that’s going to be rolling this out across the company it’s typically in HR. What’s the major aspect that distinguishes the high ranking companies from the ones ranking lower? In terms of the employee experience index you developed. Well, there are a few things actually. Employee experience is pretty much a combination of three things: culture, technology and physical space. So the highest ranking organizations, first of all, do the best job of investing in culture, technology, and physical space. They create great offices, great physical environments where employees want to show up to. Furthermore, they give employees access to the best, latest and greatest technology, so that the workforce can do their jobs. And finally, they invest in making their employees feel good about the work that they’re doing in the organization. So these high raking organizations have managers and people in positions of power who genuinely care about others. These are organizations that do a very good job of understanding their people! Both through 1-on-1 conversations and also through data in people analytics. These are also organizations that think more like a laboratory and less like a factory. They embrace failure, they test ideas, they experiment with different concepts. And that’s really what allows them to go above and beyond everyone else. From all the companies that you have researched about, what was the one strategy that surprised you the most? One of the most important things is to realize that organizations have to create with their people, not for their people. So, it’s not about coming up with an idea and just building something and showing it to the people who work there. It’s about incorporating people into the process design, in the creation process for employee experience. You have to really understand what your people care about, what they value and then, you build experiences based on that. It’s sort of like going out on a date or being in a relationship where you really have to know your spouse, you really have to try to get to know the person you’re going out on a date with. The same is true inside of our companies. We really need to get to know our people as best as we can. In the end, it’s not about doing something specifically. It’s about a way of thinking and getting what the employees feel. Why currently, more than ever before it’s fundamental to attract the best talent? This is a huge issue for corporations around the world and it continues to be a huge issue especially as we talk about this world of automation. The world is rapidly changing and there are conversations around a skills gap. I believe every organization in the world can exist without technology. But, no organization in the world can exist without people. We need to remember that even in this rapidly changing world people are still the number one asset we can’t forget. That’s why it’s never been more important and crucial to invest in employee experience. Still about talent, based on your research, what company do you think would be more successful? B: The other that has the most talented people on their staff? Well, both because you’re not going to have the best talent unless you invest in employee experiences. So, it’s kind of hard to say if it is more valuable to have a company that has great employee experiences or talented people. Because the talented people are going to go where the best employee experiences are. So if you want to be able to attract and retain the best people then you have to invest in culture, technology and physical space. Many business owners say they don’t focus on employee experience because they don’t have the budget to. Is it something that requires a big spending? I don’t think it is. Not having a budget isn’t a good excuse for why you shouldn’t be investing in employee experience. First of all, it doesn’t cost a lot of money to treat people well. Investing in employee experience is something every organization is doing in one way or the other. So if you choose to ignore culture, technology and physical space, these things will still happen, you can’t control it. We see this inside of social media all the time, it’s sort of like saying: if you don’t have a social media profile and your customers are talking about you online, should you be listening? The experience is going to be created one way or the other. It will be created based on what your organization designs or from you ignoring doing any type of purposeful design. So if it’s going to be one way or the other, you might as well take some accountability. Try to shape what it’s like to work at your company instead of just letting it happen on its own. It is true that some money is required obviously, when you think about technology, physical space, education and training. But these are investments that organizations are already making anyway. So it’s just a matter of making these investments the right way. Imagine a situation where a CEO approached you looking for advice. Even though he never heard about employee experience he feels there has to be some way to improve workforce commitment and engagement. What would you tell him to do first ? The very first thing that I would tell anybody to do first is to put people in positions of power who care about others. You have to genuinely have managers and leaders at the organization who care about the other people who work there. That’s step one. If you don’t have that, then nothing nothing else is going to matter. The second thing, and I touched on this earlier, is you have to truly know your people. I mean you really need to get to know the people who work at your company. Thanks for the read, what do you think? 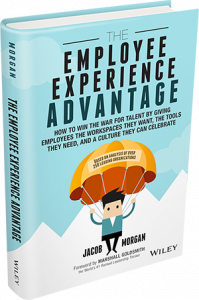 Do you agree with Jacob’s view on employee experience versus employee engagement? Jacob’s work has been endorsed by the CEOs of: Cisco, Whirlpool, T-Mobile, Best Buy, SAP, Nestle, KPMG, Schneider Electric and many others. Jacob is also the founder of “The Future If”, a global community of business leaders, authors, and futurists who explore what our future can look like. Visit TheFutureIf.com or The Future Organization.